Klipsch updates classic horn speaker with La Scala AL5 | What Hi-Fi? Klipsch is the King of the horn. The original Klipschorn speaker was launched back in 1946 and remains in production today, a level of longevity that's unrivalled in the speaker market. The La Scala is the smaller sibling to that flagship speaker and was itself first released back in 1963. The La Scala AL5 brings the speaker bang up to date, though of course still keeps the retro design. The Klipsch La Scala AL5 promises to be easier to accommodate, while still keeping the speaker's trademark efficiency and boasting increased power. It's a three-way, fully horn-loaded design, with a new K-771 1in tweeter, a 2in midrange driver and the same 15in bass driver as on the flagship Klipschorn. The 1in thick wood veneer cabinet has a decoupled design that keeps the high and low frequencies separate. 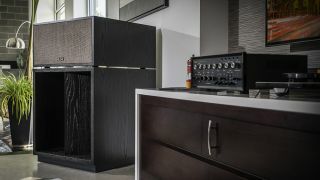 The tweeter uses Klipsch's Tractrix horn, the midrange uses a large exponential horn, while the monster 15in bass woofer sits behind a two-fold horn, inspired by the flagship three-fold design. Klipsch promises "sparkling, controlled highs, a smooth midrange" and bass that "reaches 45Hz, but does so with minimal distortion". There's a new magnetic grille design for the mid/high section and round the back you'll see a new aluminium panel for the speaker terminals. The new Klipsch La Scala AL5 is available in natural cherry, satin black ash and American walnut, and is made to order in the same place they've always been made - Hope, Arkansas, USA. The speakers will cost you £12,000 in the UK. Want to hear them? You can arrange an appointment with UK distributor, Henley Designs.